not to end up with egg on her face. Easy does it. 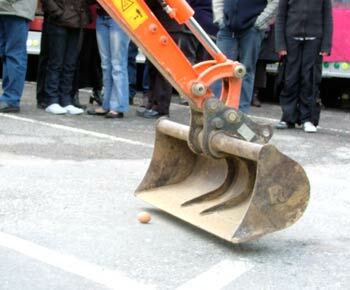 The old 'pick up an egg with a digger' game. huge increase in the slimey little buggers in the garden. and came across a few familiar faces and bottoms. Easter came early this year, but Winter came late. So the Easter weekend festivities in Trie were bitterly cold. All coats and scarves, we watched and joined in with the furthest throw competition, pick up the egg with a digger and hit the lady (a young woman wrapped in plastic and wearing a glass fronted helmet, who tried to dodge as people threw their three eggs). The day started with an English breakfast, served up by the local brits. Perry took the orders and served the drinks as the rest sweated away over the pans and hotplates, under the arches of the Mairie. All in all about 5000 eggs were fried, juggled and thrown over the weekend. We haven't had anywhere near as many mice in the garden this year, but the in-house population has been at work. 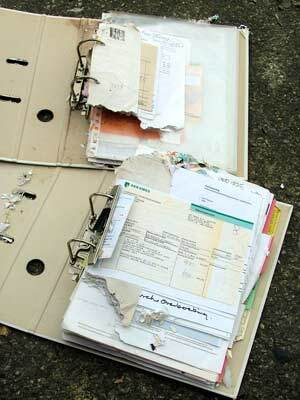 When we cleared the boxes under the stairs, we discovered that a lot of our bookkeeping had been chewed up for nesting material. A few sachets of poison and the late night buffeting ended. We also discovered that some of our boxes of books were very damp where they'd been placed close to the walls. These being made of clay and not built on foundations, they draw up moisture. This in turn was absorbed by the boxes and the books inside. We had to chuck away quite a few though thankfully, the old leather-bound books Perry had from his grandfather were still dry. 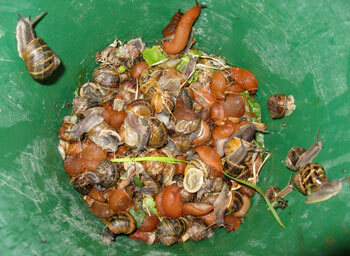 Talking of humidity, the wet weather has created the perfect conditions for slugs and snails. We have never seen so many. Lettuces and aubergines that pop their heads up out of the soil are immediately eaten. Whole rows of beans and basil scoffed in the night. Time for drastic measures. Caroline ventured out several nights down to the vegetable garden, armed with her wellies, a torch, gloves and a bucket. She came back each time with hundreds of the slimey buggers. They were all over the garden, in locust mode, attacking all in their paths. Her solution was to empty out the bucket on the ground and stamp and twist her boots over them. Not a pretty sight, but a quicker death than pouring salt all over them and placing a plate on top to stop them escaping. I suppose that an alternative would be to capture the snails, clean them out with a supply of pasta and then wash them out with vinegar, before cooking them. But that's a lot of work. And what to do with the the enormous, orange slugs? Marshmallow anyone? 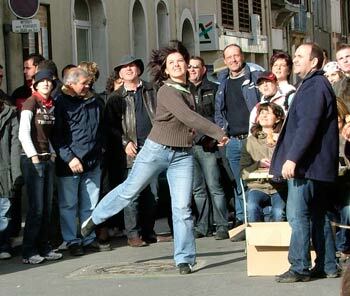 March is also the time for the annual agricultural show in Tarbes. 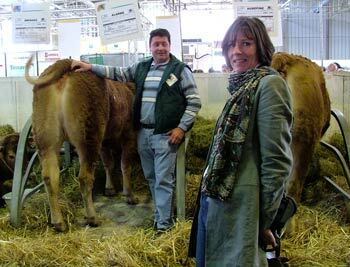 Farmers from all over SW France come to show their prize bulls and calfs, sheep, horses and the latest in farming implements and technology. We went over to see the beautiful Charolais, Limousins and Blondes d'Aquitaines. It was there that we also met up with some of the usual suspects. Christian Couget, displaying some of his Limousins and our other friends from Sadournin, Michel and Alain Carrau from Sadournin who have a duck and cattle farm. A little different to the Ideal Home Exhibition, but the priciple is the same. Mind you, what Perry later found stuck to his shoe smelt nothing like designer furniture. With Spring around the corner, our neighbours are preparing the fields for this year's crops. Maize and sunflower seeds will soon be going into the ground. There were some nights when the farmers seemed to drive back and forth through the night, gradually breaking down the soil to fine granules and spreading fertilizer before the special seed planters arrive. 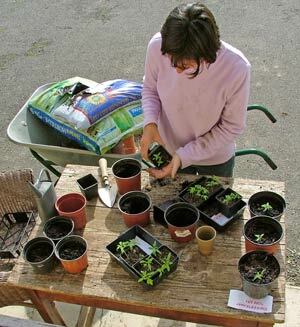 Caroline too was preparing her ground, albeit in pots, for her home-grown seeds, taken from last year's plants. The tomatoes, aubergines, peppers, basil, rocket and coriander all watered and nurtured as they began to break the surface and establish themselves before being put into the vegetable garden. Meanwhile, we were running the rotavator back and forth, removing the winter weeds and turning the old, dry chicken guano we found in the chicken house, into the soil. Later, the snails and slugs decimated many plants, so we had to start again. The tomatoes would all rot in the wet conditions and be replaced. Even Perry's vines spent some time with their roots standing in water. That's why it's so green here.